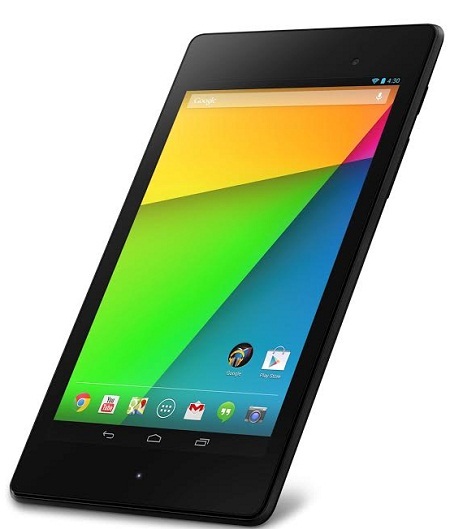 New Delhi, December 5, 2013: ASUS and Google today announced the launch of the all new Nexus 7 – thinner, lighter, and faster.The ‘Nexus 7 2013’ comes with the stunning 7-inch IPS display delivers unmatched visual acuity and sharpness. With over 2.3 million pixels packed in to the screen at 1920 x 1200 with 323 pixels per inch (PPI), it’s the sharpest ever screen on a 7-inch tablet and with a rated brightness of 400 nits, its bright enough for outdoor use too. “We are extremely elated to bring the all new Nexus 7 which is sleeker yet comprises the same sized screen and significantly increasing performance. The quality of the pixels has been improved with a 30% wider color gamut than the previous generation model; ensuring colors are both accurate and vibrant to further enhance the user experience. Our constant quest for the incredible has led us to further innovate and deliver a device which is the ultimate blend of power and portability,” said Peter Chang, Regional Head – South Asia & Country Manager – System Business Group – ASUS India. The new Nexus 7 builds upon the success of last year’s Nexus 7 to bring the best of ASUS and Google together in a premium device.The new Nexus 7 by ASUS is an attractive, smear free soft touch tablet with finish on back cover for non-slip grip. It has thinner bezels and slimmer profile for more comfortable one-handed use. It has a 7-inch 16:10 Full HD (1920 x 1200 WUXGA) display with a 30 percent wider color gamut and 10-finger multi-touch; Rear-facing 5 megapixel camera with large f/2.4 aperture; Quad-core Qualcomm® Snapdragon™ S4 Pro (APQ8064-1AA, with Krait 300 cores) processor running at 1.5GHz; 2GB RAM; Up to 32GB of fast internal eMMC storage with FSTRIM function; Dual stereo SonicMaster speakers with Fraunhofer Cingo virtual surround sound technology; Wireless charging and Lead device for Android 4.3. It is powerful, portable and made for what matters to you. It brings you the perfect mix of power and portability and features the world’s sharpest 7″ tablet screen – putting over 2.3 million pixels in the palm of your hand.With 323 pixels packed into every inch, you can read text that’s sharper than the printed page, see images more vivid than the highest quality photo magazine, and watch videos come to life in vibrant 1080p HD. The device is lighter than ever and lasts longer.The clean, simple design features a slim body, a thin bezel and a soft-touch, matte back. So it sits comfortably in the palm of your hand while the bright, beautiful 7″ display brings your entertainment to life.At just 0.64lbs (290g), ‘the all-new Nexus 7 2013’is light enough to take anywhere and fits easily in bags, backpacks, and even back-pockets. With up to 9 hours of HD video playback and 10 hours of web browsing or e-reading, there’s plenty of juice to get you through the day, and built-in wireless charging means you can charge, grab, and go. The sharpest 7″ tablet screen ever gives an eye-popping performance and sound that surrounds. The Nexus 7 2013 is great for gaming, and with favorites like Prince of Persia and Riptide GP 2, you can tilt, tap, and touch your way to the top. The brand new Play Games app lets you track your achievements, play with (or against) gamers around the world, and discover new exciting games. And with an ever-expanding number of tablet-optimized apps, you’ll find all the apps you love and love the many new apps you’ll find. The device gives you numerous options with the world’s largest collection of eBooks, listen to streaming radio and millions of songs, and immerse yourself in thousands of movies and TV shows on Google Play. The new Nexus 7 comes with the latest version of the world’s most popular mobile operating system, so it’s fast, fun, and easy to make your own.Share your tablet with friends and family – each person has a separate customizable space, including personal homescreens, wallpaper, apps, storage, and more. You can also manage access to apps and content to create an experience that’s appropriate for each member of the family. The experience improves even further once you start playing games or watching movies as SonicMaster Audio, in conjunction with Fraunhofer Cingo technology, springs to life to deliver an immersive audio experience. Nexus 7 features high-quality dual stereo speakers built to the SonicMaster specification – which includes superior construction, large resonance chambers and professional tuning – that combine with Fraunhofer Cingo technology to deliver crystal clear virtual surround for an unforgettable experience. The nexus 7 16GB version is priced at 20,990 in India, which only supports GPS & Wi Fi as connectivity features, whereas the 32GB version is costs 27,999 that also supports 4g LTE. Big Kid Life Firefighter Android App Review: Educational Experience For Improving Skills!